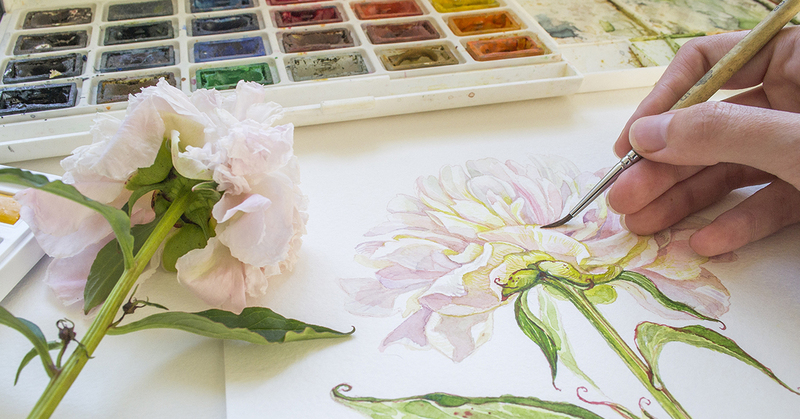 What exactly makes a paper the right selection for use as a watercolor or fluid media surface? Paper is paper, is paper… right? Start with the sizing—and no, we don’t mean actual measurements. “Sizing” is a crucial treatment to papers, making them suitable for watercolor. While the sheet is being formed in manufacturing, a sizing is added to the paper pulp, which is commonly referred to as “internal sizing”. The sheet then is either externally sized by immersing the sheet in a water and sizing solution (referred to as “tub sizing”) or is spray surface coated (referred to as “external” or “surface sizing”). Many top professional brands boast both internal and external sizing, with lesser quality papers being only externally sized. Sizing is either gelatin (animal sourced, historically the original sizing) or starch (plant sourced) based, which also varies by manufacturer. Some sizing is even impregnated with a fungicide, to protect the paper and prevent molding. Sizing aids the paper in absorbing moisture evenly, and allows the pigment to sit up on the surface where it refracts color more brightly, instead of soaking in and giving a “dull” appearance. The color then can easily be reworked due to the accessibility of the pigment remaining on the surface. The name “paper” can sometimes be a misnomer in the world of art supplies, where all art papers are NOT manufactured from wood pulp. A high percentage of watercolor papers are either a 100% cotton “rag” paper (once made from trimmed cotton rags) or a cotton and alpha cellulose blend. Low quality or student grade papers may be made exclusively. Other papers may be made of wood pulp, alpha cellulose, or a combination therof. These contain lignins- a component in the plant that helps give the strength and rigidity to cell walls—but sadly attributes to breaking down of the paper as it becomes acidic over time. Cotton far exceeds pulp or other plant cellulose products, due to longer, stronger fibers that are more durable and naturally absorbent. These stand up to repeated erasing with underdrawings, scrubbing out painting mistakes, and taping and stretching before painting. Pricewise, wood pulp and alpha cellulose papers are more cost effective for the beginner, but come at the price of frustration due to being less durable, and unforgiving, and not ultimately archival. Always look for buzzwords like lignin-free, acid-free, and archival in the descriptions of watercolor papers, to help protect the longevity of your work. The “press” of a watercolor paper is more than just its’ surface texture. It actually is determined by the way that the paper is finished, as it is run through cylinders that are either heated or cooled. This creates the final paper texture. The purpose of texture in watercolor paper is to create a sense of depth for the pigment, as the peaks and valleys refract color differently, and add interest to the work. Cold Press: This lightly textured, toothy surface grabs pigment, and is created from pressing finished paper between felt-covered, cold cylinders. It is the most popular of the presses, although each manufacturer’s texture is slightly different. It is also excellent for pastels, charcoal works, and more. Hot Press: This is a smooth, flat, even vellum surface with a fine tooth created by running the wet paper through very hot cylinders that work almost like an iron on wrinkly clothes. Hot Press does not offer a texture that is as absorbent, so washes tend to sit on the surface. It is most ideal for pen and ink, watercolor gouache, brush linework, fluid media paintings, and mixed media works. Rough Press: A more pronounced tooth and texture than cold press, with some brands being extremely rough and textured. Created from placing the wet sheets between textured blankets and/or air drying. Tends to produce a grainy effect as the pigment particles collect in the recesses of the paper texture. All paper is measured by weight, but what does it really mean? Stemming from the British Imperial System, paper weights have to do traditionally with the weight of a ream (500 sheets) of the paper from that particular size. So, this means if a watercolor paper is called 140 pounds in a 22×30” size, 500 sheets of it weigh 140lbs. 300lb 22×30” paper weighs 300lbs for 500 sheets, etc. This can sometimes get particularly confusing when the sheets become larger than a full sized 22×30” sheet, as they are still measured by the ream weight—meaning 1114lb 40×60” paper is actually the same paper thickness as the 300lb paper! When in doubt, feel free to ask for assistance when purchasing paper. Paper weight really comes into play when working on your watercolor painting. The most standard paper for watercolor is typically 140lbs, but it will buckle and curl if not taped down or stretched, if you work with lots of wash techniques or cover large amounts of paper with water at the same time. 300lb paper is thicker and will lay flat when even fully saturated, so some artists find the added expense a welcomed trade off to not having to stretch, tape, or simply deal with thinner paper antics. Paper lower weights than 140 lbs tend to be less durable to work with, using a lot of washes, scrubbing, or erasing and are best used for pen and ink or drier watercolor techniques after being taped or stretched. There are watercolor papers for every application and interest, from pads, to blocks, from half and full sheets, to cut pieces, in every quality grade and price range imaginable. Take the time to read about the products before purchasing, to find the ideal product and price point to suit your needs. Need more help choosing your watercolor supplies? Visit a Jerry’s Artarama location near you for a wide selection of watercolor products for artists, as well as professional advice about materials and techniques.